This wonderfully visual book could be a picture book and by using photographs, text messages, newspaper articles, postcards, printing, and so much more. Glory Fleming is a piano prodigy. She has played the world over, lost her mother when she was eight years old and now has a strict father as her manager. Glory misses her mother, practices piano all day long and doesn't have much in her life than her memories and her piano. Until Argentinian Frank moves next door with his family; Glory and Frank fall in love. When her father plans a tour to Europe, will it drive a wedge between Glory and Frank? While on tour, each of Glory's performances becomes marred by her constant playing of Chopsticks. After Glory returns with her father, he takes her to Golden Hands Rest Facility where she has been on numerous occasions since her mother's death. What will become of Glory and Frank, this book is so much beauty and pain, read it, enjoy it, talk about it. 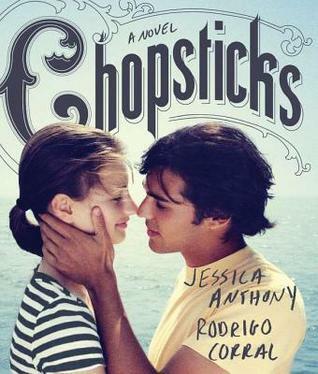 Sign into Goodreads to see if any of your friends have read Chopsticks. Yes, have you read or listened to it? I have read it. I don't think this book would translate very well into an audiobook.